THE foot is a complex piece of engineering, not always treated with the respect it deserves which can cause problems. Plantar fasciitis is a common and painful condition which can affect almost anyone. Causes include being seriously overweight, being on one’s feet for long periods of time and over-exertion through constant running, sport or physical activity. It affects the longitudinal arch (medial aspect) of the foot which is maintained by the shape of the bones and a network of muscles, ligaments and tendons. During walking and running this arch is compressed while the ligaments stretch and recoil releasing energy. When setting off, the weight of the body passes first through the heel, spreading over the lateral part for balance in a forward motion to the ball of the foot, and onto the big toe to complete each step. Cushioning the sole of the foot, or plantar aspect, is subcutaneous fat then skin, and within these layers is connective tissue known as fascia. Fascia surrounds and protects the bones and muscles not only of the foot but the entire body, in a continuous web. Plantar Fasciitis is the name given to inflammation or a tear in the sole of the foot anywhere from the heel to the ball. What can be done? 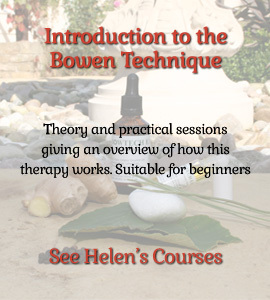 Apart from rest to allow time for the fascia to heal, which is impractical in day to day life, therapies such as the Bowen Technique have proved beneficial. Self-help remedies include the use of Bowtech Ease to massage or press over the affected area to relieve pain and strapping the foot in such a way to ‘cradle’ the heel and provide total foot support. Soaking the feet in warm water with Bexters soda crystals can ease aches and pains, and a spa-bath with massage water jets might help. Exercises to strengthen and stretch the Achilles tendon and lower leg muscles are recommended and very importantly, those affected must try not to limp as foot muscles used for walking may then become stiff and slow the healing process. A simple exercise is to stand on the first stair with heels hanging over the edge and push downwards to stretch the calf muscles. While seated, place feet over a bottle of water or wooden roller and roll back and forth. Recovery time can be lengthy. We love to hear from you and where possible try always to respond personally. Many of your questions have common themes which we share here to help others become more familiar with our specialist products… keep them coming!